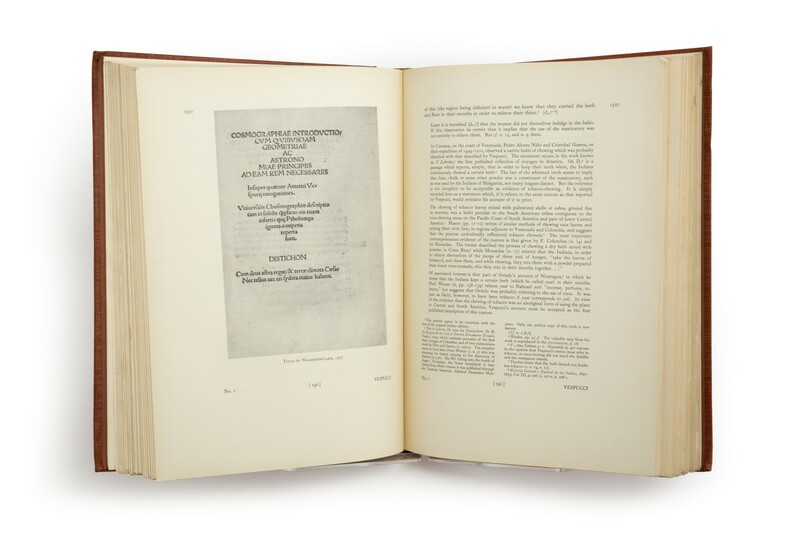 On the creation of the collection, see H. George Fletcher, “Indomitable Collector: George Arents, Jr. and The New York Public Library” in Biblion: The Bulletin of The New York Public Library, volume 9 (Fall 2000-Spring 2001), pp.87-103. Ten parts in two volumes (34 × 24.5 cm), Volume I (1958-1961). Part 1 (Imprints 1507-1571, 1958): (4) pp., 52 pp., including frontispiece portrait of George Arents, Jr., and view of the collection installed in NYPL; plus 12 leaves of plates (nos. 1-24). Part 2 (Imprints 1571-1589, June 1959): (4) pp., pp.53-98 (2); plus 14 leaves of plates (nos. 25-52). Part 3 (Imprints 1590-1609, December 1959): (2) pp., pp.99-146; plus 12 leaves of plates (nos. 53-76). Part 4 (Imprints 1610-1619, October 1960): (2) pp., pp.47-192; plus 14 leaves of plates (nos. 77-104). Part 5 (Imprints 1620-1632, March 1961): (4) pp., pp.193-240, plus 6 leaves of plates (nos. 105-116). Errata slip tipped to p.217. Part 6 (Imprints 1632-1650, October 1961): (2) pp., pp.241-300; plus 18 leaves of plates (nos. 117-152). 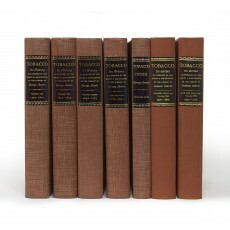 Volume II (1962-1969). Part 7 (Imprints 1651-1672, March 1962): (4) pp., pp.301-384 (2), plus 12 leaves of plates (nos. 153-176). Part 8 (Imprints 1673-1687, November 1967): (4) pp., pp.385-475 (3), plus 12 leaves of plates (nos. 177-200). Part 9 (Imprints 1687-1702, July 1968): (2) pp., pp.477-565 (3), plus 12 leaves of plates (nos. 201-224). Part 10 (Imprints 1703-1724, June 1969): [no half-title issued], pp.567-650 (2) plus 12 leaves of plates (nos. 225-248). 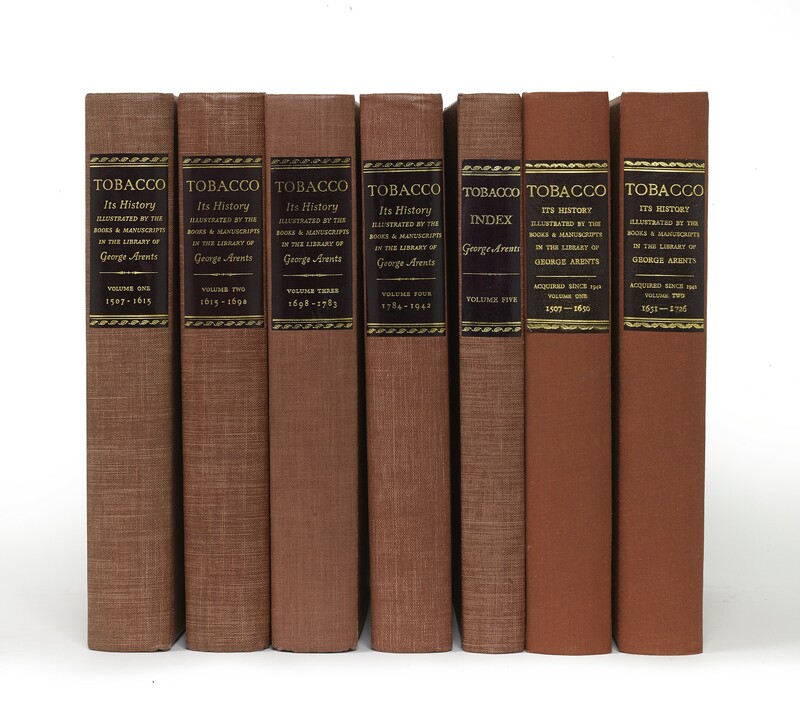 The two volumes uniformly bound in cloth by Bernard Middleton (to match volumes I-V; upper covers of publisher’s printed wrappers bound in).